Hold on to your joysticks, Scott Pilgrim fans! Scott Pilgrim vs. The World is coming to the PSN August 10th! Ubisoft's been letting more and more info about its tie-in to Scott Pilgrim Vs. The World hit the light over the past couple of days. Last week, it was revealed that the game would be a timed-exclusive for the PSN, meaning 360 owners would have to wait for a while to play the game. Now, Ubi's provided an official date for the game's PS3 release: August 10th. No release date for Xbox Live has been announced yet. This means that the game will be playable three days before the movie itself comes out, though whether or not the game will spoil the film's plot for fans remains to be seen. 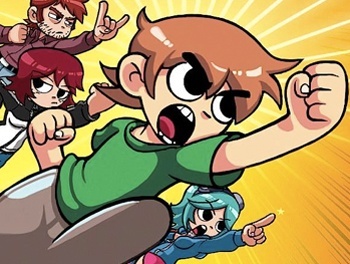 The visual style is certainly similar to Bryan Lee O'Malley's comic series, which will conclude on July 20th when Scott Pilgrim's Finest Hour is released. Whether the game is going to be a completely faithful retelling of the story in either the movie or the comics hasn't been explained, yet. O'Malley has explained that the movie and the comic series are similar, but the film's ending will probably be a bit different from the comics since he was still writing Finest Hour when the movie was in production. "Note that I haven't finished writing it yet, but they're already making a movie," he stated in a twitter post a while ago. "Their ending is their ending." The game is on display at E3, and impressions of the game are enthusiastic so far. Members of The Escapist are currently covering the show, so be sure to check out all their coverage.